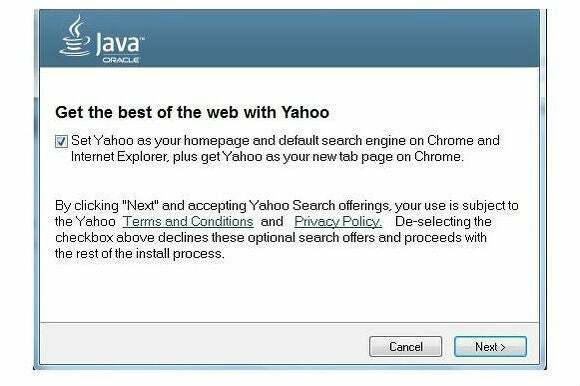 Users who install Java will have to uncheck a box to avoid getting Yahoo as their default home page and search engine. Attention Java users: Your long national nightmare of avoiding the Ask.com toolbar is over, replaced by the slightly less terrifying prospect of Yahoo defaults. As The Wall Street Journal reports, Oracle’s Java installer will no longer attempt to put the Ask.com toolbar and search engine on users’ machines. Instead, the installer will try to set Yahoo as the default search engine in Chrome and Internet Explorer, and as the default homepage in Chrome. Oracle has long profited from Java by stuffing software into the installation and update process, including not just the Ask.com toolbar but virus scanners from McAfee. The options to install these products are typically checked off by default, so users end up with unwanted software unless they carefully read through each step of the installation process. Speaking to the Journal, a Yahoo spokesman tried to downplay the deceptive nature of these installations. “We have definitely made sure that our onboarding process is one that is highly transparent and gives users choice,” the spokesman said. Why this matters: Yahoo search may be a step up in terms of quality, especially with the ouster of any noisome toolbars. But as Harvard University business professor Ben Edelman points out in the Journal’s piece, it’s still a deplorable tactic, potentially eroding trust in software updates even when they include vital security patches. (Java tends to be a major target for security exploits.) Getting involved in this business could prove lucrative for Yahoo, but at the same time lends the company a slimy patina that was once reserved for lesser rivals.